Recap of the Last 5 Games (Games 66-70) · Let's Go Amerks! Welcome to the 14th part of a 15 part season series highlighting the last five games (the last segment will be six games) showing off the stats, standings, highlights, transactions and whatever else took place prior to the next five games. The goal is to post these the day of the next game of a five game set. A little different than a weekly format to give us a better snapshot of trends as the season goes. 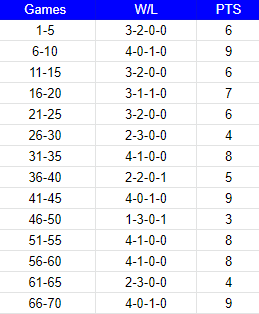 An exciting stretch of five games going 4-0-1-0 after previously going 2-3-0-0. Over the last 20 games the Amerks have won 14 games overall and only lost five games in regulation. There’s six games remaining in the regular season and overall they continue to trend where they need to be. Even though Zach Redmond has missed the last six games with a nagging lower body injury he’s still a team leader and one of the leagues leading defensemen. Two come back wins and clinching a playoff spot are the highlights of the last five games. The team came from behind by scoring four goals in the third period on the road in Binghamton to clinch a playoff spot in the 2019 Calder Cup playoffs. 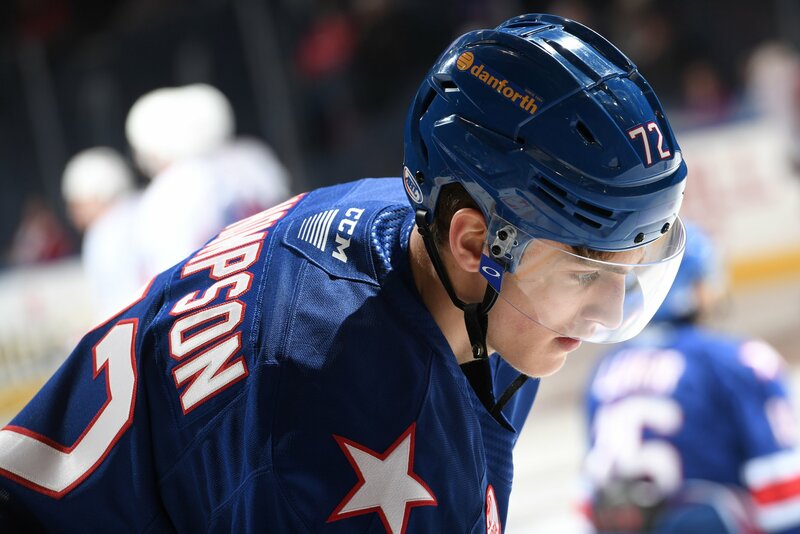 Victor Olofsson was called up to Buffalo and Tage Thompson was assigned to Rochester. On the surface that sounds like a losing situation for Rochester – losing your leading scorer and gaining a player that wasn’t producing in the NHL. Tage Thompson arrived with a positive attitude, confidence, and followed it up with three key goals in his first two games along with an assist. Having your top goalie pulled in two straight games could be a concern but Adam Wilcox stepped right in to win some games. Wedgewood addressed the situation as just a bad week, maybe his only bad week of the season, and complimented how the team stepped up at the same time. There’s six games remaining, three against Syracuse, one against Cleveland, one against Binghamton, and the final game vs Belleville. The North Division title is still up for grabs and this weekend could determine if the race continues into the final weekend. 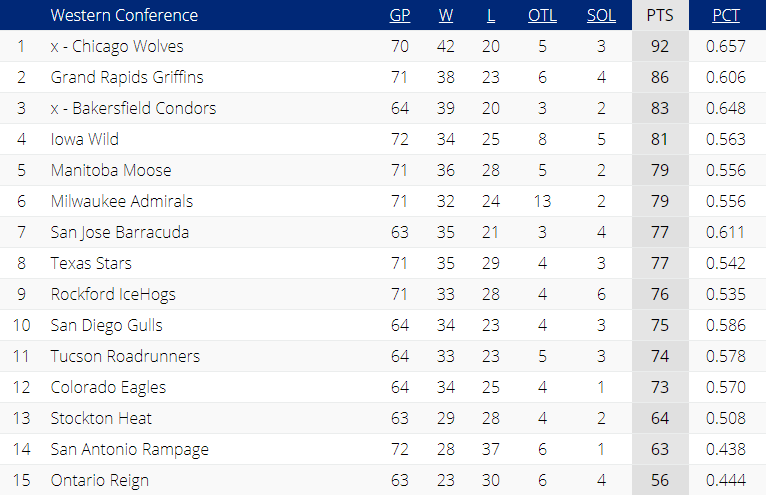 Syracuse is currently three points ahead of Rochester and will look to all but secure the division title this weekend. It’s pretty simple, score more than the other team and win! Amerks outscored opponents 23-16 and won more games. Revolutionary. Shooting the puck, creating more chances, and it creates wins. 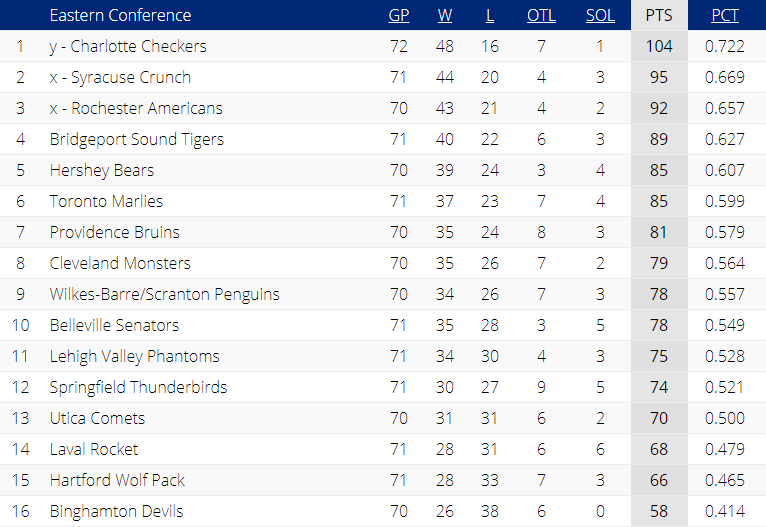 Heading into the 71st game of the season the Amerks appear to be in sole possession of second place with a chance to still grab the North Division title. Danny O’Regan winning the game in overtime in Toronto. Andrew Oglevie – upper body – unknown – Played March 22, hasn’t skated since. Zach Redmond – lower body – day to day – Played 3/16, did not practice week of 3/20. If the playoffs started tonight he could play. Remains out to heal up. Returned to team practice 4/4. Possible for 4/5. 3/27 Casey Fitzgerald signed ATO out of Boston College. Is also signed through 2019/2020 season.